Cody, W.J.. "Club-moss". The Canadian Encyclopedia, 26 March 2015, Historica Canada. https://www.thecanadianencyclopedia.ca/en/article/club-moss. Accessed 19 April 2019. 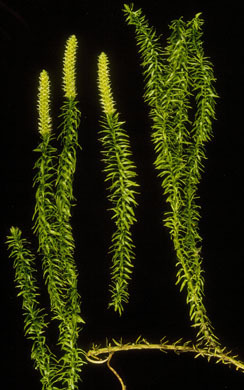 Club-moss, perennial, evergreen, coarsely mosslike plants belonging to the genera Diphasiastrum, Huperzia, Lycopodiella and Lycopodium of the club-moss family (Lycopodiaceae). Club mosses (courtesy Jim Basinger). 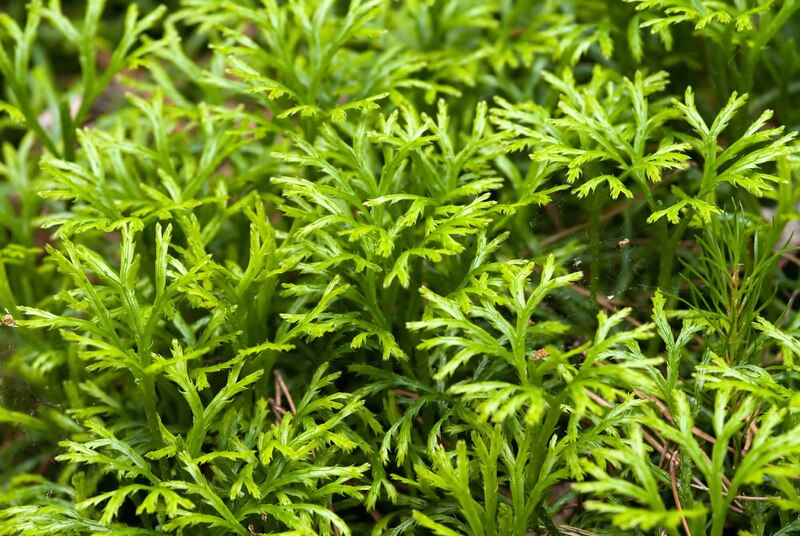 Club-moss, perennial, evergreen, coarsely mosslike plants belonging to the genera Diphasiastrum, Huperzia, Lycopodiella and Lycopodium of the club-moss family (Lycopodiaceae). Stems have forked branches, and are often prostrate and covered with scalelike leaves. Leaves are lanceolate to oblong or slender, tapering to linear in shape, entire or minutely toothed. Club-mosses show alternation of generations, eg, an asexual phase alternates with a sexual one. Each stage is an independent plant. Reproduction is accomplished by spores produced in spore cases (sporangia) borne on the upper surfaces of modified leaves of plants of the asexual or sporophyte phase. In most Canadian species, these modified leaves are condensed to form a cone. Spores germinate, producing small underground plants (prothallia) on which are borne antheridia, which produce sperm, and archegonia, which produce eggs. Prothallia are the sexual generation. 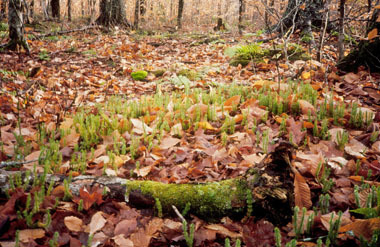 Fertilization of the egg and subsequent development produces the familiar club-moss plant, the sporophyte generation. Some species reproduce by gemmae (asexual buds that detach from the parent plant), eg, in Canada, H. selago. This diverse group dates at least to the Devonian period (410-353 million years ago). Tree-sized fossil representatives (eg, Lepidodendron and Sigillaria) are abundant in coal beds of the Carboniferous period (353-300 million years old). About 100 living species are known. They are most abundant in tropical and subtropical regions, but 19 species occur in Canada, mainly in moist, wooded regions. D. alpinum and H. selago are alpine and arctic-alpine. Running pine (D. complanatum and D. digitatum) and ground pine (Lycopodium obscurum) make good Christmas decorations. The yellow spores were formerly used for coating pills and in medicines; they are also explosive and were used in flash guns. Flora of North America Editorial Committee, ed, Flora of North America - North of Mexico: Pteridophytes and Gymnosperms (1993).